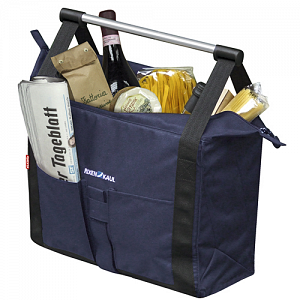 Fordable transportation bag for racks, thoughtfully and functionally designed. Whether at college, office or shopping, Cargo offers its volume only when needed. "Cargo" is highly durable due to its solid base and an internal diagonal aluminum frame. The aluminum handle slides into the flat fixation position by smart folding technology. The KLICKfix Modul-rail locking device, which comes with this bag, fits all rack with tubing diameters Ø 8-16mm. The movable hooks of this rail could be horizontally adjusted. The shoulder belt can be fixed onto the robust eyelets at the sides. The slightly inclined position of the bag increases legroom and comfort.